You're no doubt well-aware of the potentially deadly consequences of melanoma. That's why it's so crucial that you do a monthly skin check of your moles and see a dermatologist for any changing lesions, as well as an annual full-body examination. 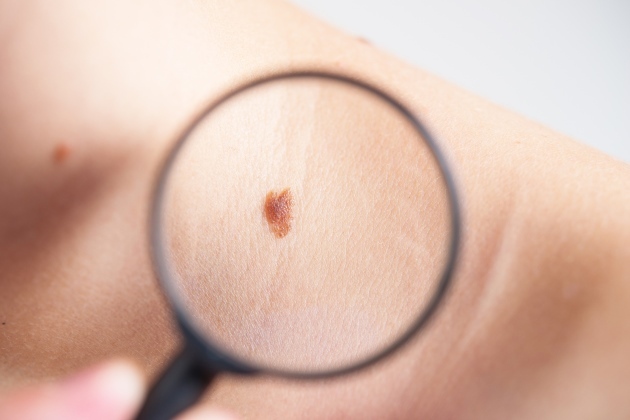 Chances are, however, that you've never heard of the fastest-growing and most deadly form of skin cancer, Merkel cell carcinoma (MCC) — and you need to get up to speed. The good news: with early detection and immediate evaluation by your doctor, MCC can be treatable. Although MCC has been classified as a rare cancer, its incidence appears to be rapidly increasing. Data shows that rates of MCC increased an alarming 95% from 2000-13. The cancer is highly aggressive, and proves to be fatal much faster than melanoma. if you have conditions such as HIV, lymphoma or leukemia, which can compromise your immunity. What Are The Symptoms of MCC? According to the Mayo Clinic, Merkel cell carcinoma usually looks like a flesh-colored or bluish-red nodule. It's painless. It often presents on the face, head or neck, although it can appear anywhere on your body. Because MCC can grow quickly and spread to other parts of your body, if you see a lesion that looks unusual and doesn't heal quickly, it's important to bring it to your doctor's attention right away. If you are diagnosed with MCC, discuss all treatment options with your doctor.Traditional surgery, Mohs micrographic surgery, chemotherapy, and clinical trial participation are all options depending upon the stage of the disease you are diagnosed at. Wear a wide-brimmed hat and sunglasses outdoors. Tell your doctor if you see any changes to an existing mole, such as a shift in color or size.